The team put in a fantastic performance and reached more than halfway across the Channel. Then in hour six, events took a bad turn and sadly the attempt had to be aborted. Our number six swimmer had been swimming for 55 minutes when he suffered from a seizure, and we had to pull him out of the water. We set off back to Dover to get him medical attention. On the return journey we were met by the RNLI lifeboat and a coastguard helicopter who transferred a medical team to the Anastasia where they thankfully stabilised him. At Dover, an ambulance took him to Ashford hospital. We’d like to thank the quick reaction of Eddie Spelling (the pilot) who quickly recognised the danger our swimmer was in, the first response from the crew and team on the boat and the emergency services.they were all amazing. 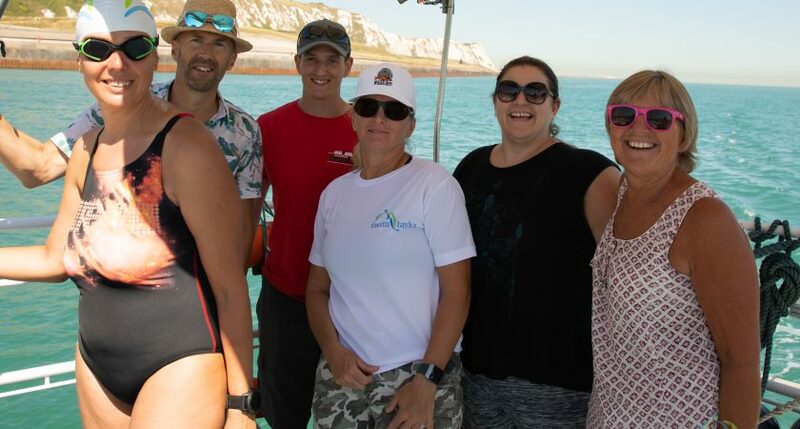 The team had reached the separation zone of the English Channel, which is approximately halfway across the English Channel, and although this area is reknown for seaweed and jellyfish no evidence of jellyfish stings were found on our swimmer. The relay team the next day was in shock and as to be expected needed answers to why this happened. We can be clear to say the due diligence that we went through for all swimmers was exceptional going beyond the requirements of the Channel Swimming and Pilot Federation. A 2 am night swim, designed to disorient and confuse the swimmers. He continued to train right up to our English Channel relay attempt, his medical report from a doctors declaring him fit to swim. With everything taken into account, our swimmer was deemed a fit and healthy, competent team member and SwimTayka would in retrospect, still have made the same decision to include him. What caused our swimmer to have a seizure on Friday night we may never know, he may never know. But what we do know is that he is alive and fit and well again and that is the best news we can have under the circumstances. We have provided as much information above as we can about the event, if you would like to talk to SwimTayka about it privately please contact us (details below).